On this page we describe the results for determining the solubility of HDM extracts. We have dissolved the Dermatophagoides pteronyssinus extract FD (freeze-dried) and whole culture D. farinae extract FD (freeze-dried) in 70% DMSO. We have compared this with demineralized water (demi water) and a borate buffer. DMSO (dimethyl sulfoxide) is a organic compound which is already widely used as a polar aprotic solvent. DMSO is therefore very suitable as a solvent in chemical reactions and a large number of organic compounds dissolve well in DMSO. By using DMSO, the mass percentage of solubility of a substance can be increased for the benefit of chemical reactions. Because DMSO is low toxic ( LD50, oral, rat, 14,500 mg/kg) and increases the absorption rate of some compounds through the skin, and other organic tissues, it is also used in the medical and cosmetic industry. Make a photo of the solutions after 5 minutes, 15 minutes and 2 ½ hour. For comparison we have made a total picture of each batch. The tests are performed at room temperature (19- 20°C). 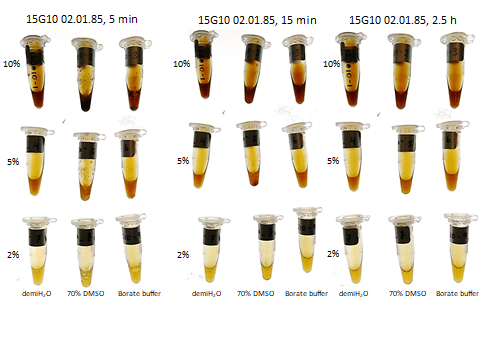 On the next pages you can see the pictures of the solubility of the D. farinae and D. pteronyssinus extracts. Demi water: the extracts are all completely dissolved within 5 minutes. Borate buffer: the extracts are all completely dissolved within 15 minutes. 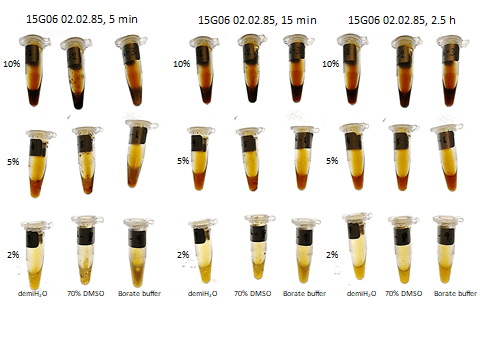 70% DMSO: the extracts are all completely dissolved within 2 ½ hours.